Raclette is both a type of cheese and, informally, a dish featuring this cheese. Traditional Raclette is a semi-firm, salted cheese made from cow's milk. However, varieties exist made with white wine, pepper, herbs, or smoked. The cheese originated in the Swiss canton of Valais, but is today also produced in the French regions of Savoie and Franche-Comté, and is available worldwide. 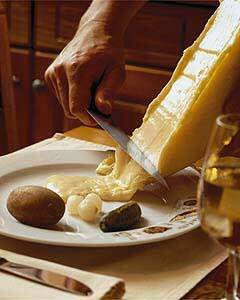 Raclette is also a dish indigenous to parts of Switzerland, Wallonia and France. The Raclette cheese round is heated, either in front of a fire or by a special machine, then scraped onto diners' plates; the term raclette derives from the French racler, meaning "to scrape". Traditionally, it is accompanied by small firm potatoes (Bintje, Charlotte or Raclette varieties), gherkins, pickled onions, dried meat, such as prosciutto and viande des Grisons, sliced peppers, tomato, onion, mushrooms, pears, and dusted with paprika and fresh-ground black pepper. In the Swiss canton of Valais, raclette is typically served with tea or other warm beverages. Another popular option is to serve raclette with white wine, such as the traditional Savoie wine or Fendant, but Riesling and Pinot Gris are also common. Raclette was mentioned in medieval writings as a particularly nutritious meal consumed by peasants in mountainous Switzerland. Traditionally, the Swiss cow herders used to take the cheese with them when they were moving cows to or from the pastures up in the mountains. In the evenings around the campfire, they would place the cheese next to the fire and, when it had reached the perfect softness, scrape it on top of some bread. 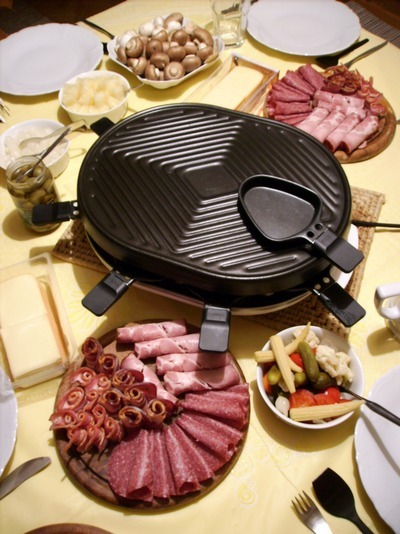 A modern way of serving raclette involves an electric table-top grill with small pans, known as coupelles, to heat slices of raclette cheese in. Generally the grill is surmounted by a hot plate or griddle. The cheese is brought to the table sliced, accompanied by platters of boiled or steamed potatoes, other vegetables, charcuterie, and perhaps seafood. Diners create their own small packages of food by cooking small amounts of meat, vegetables and seafood on the griddle. These are then mixed with potatoes and topped with cheese in the small, wedge-shaped coupelles that are placed under the grill to melt and brown the cheese. Alternatively, slices of cheese may be melted and simply poured over food on the plate. The accent in raclette dining is on relaxed and sociable eating and drinking, the meal often running to several hours. French and other European supermarkets generally stock both the grill apparatus and ready-sliced cheese and charcuterie selections for use with it. Restaurants also provide raclette evenings for parties of diners. Left: A modern electric Raclette grill and various accompanying foods.